The dig team say the two wooden stakes found in Plumstead appear to have cuts made by a metal axe. Mr Carver said: "We know from other sites nearby that this area was probably crisscrossed by a network of pathways. "As excavation works for the Plumstead tunnel portal got under way our archaeologists uncovered several wooden stakes and at least two that appear to have cut marks from a metal axe. "Although we haven't identified an actual trackway yet, the timbers are similar to those used to make the trackways and certainly show that people were in the area exploiting the woodland." 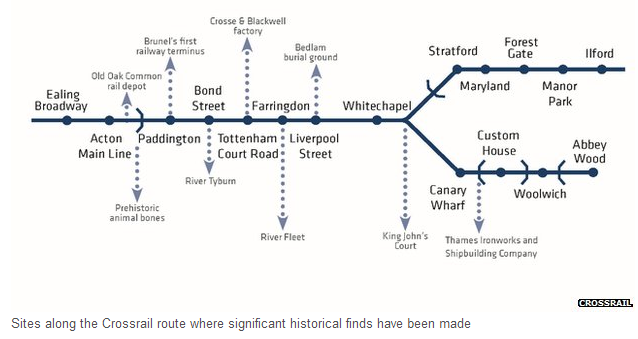 Excavation at the Plumstead tunnel entrance began last month and results of analysis carried out on items found there recently confirmed they were made by humans, a Crossrail spokeswoman said. "From the geology in the location they were found we know it was Bronze Age construction," she added. 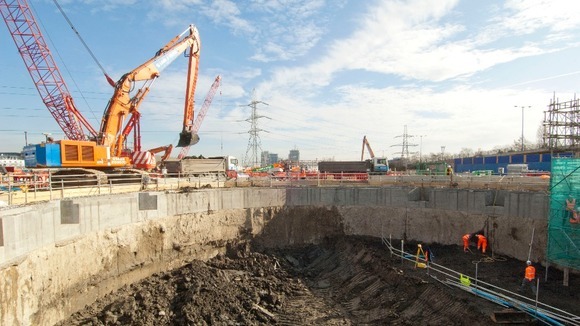 Tunnelling is due to begin at the Plumstead site early next year. Boring machines will dig twin 1.6-mile (2.6km) tunnels under the River Thames. Once complete, the rail line will run from Abbey Wood in south-east London to Heathrow and Maidenhead, Berkshire, in the west. 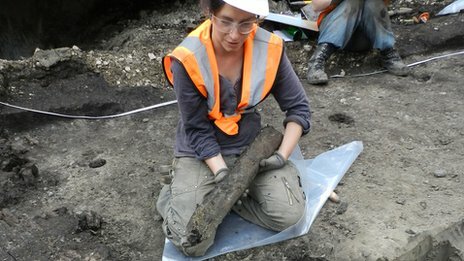 The Crossrail archaeologists say the large network of timber pathways gave Bronze Age hunters easier access to the wildlife living on the area's lush wetlands. A month-long exhibition of artefacts found during archaeology digs at Crossrail work sites across London opened on Friday. Among the exhibits at Crossrail's visitor information centre in St Giles High Street are medieval human bones found at Liverpool Street, a rare amber find and a piece of mammoth jaw bone. Archaeological investigations at Limmo Peninsula, near Canning Town. Credit: Crossrail.